Kate received her Bachelors of Rehabilitation Science as well as her Doctorate of Physical Therapy from Northeastern University. She treats a variety of orthopedic spine and extremity injuries utilizing manual hands on techniques, therapeutic exercise and functional activities. These techniques quickly allow her patients to return to their prior level of function. She also treats dizziness and balance disorders and youth/adult concussions. 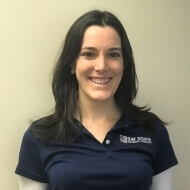 Kate strives to develop an individualized treatment plan for each patient to help them reach their rehabilitation goals. She also integrates patient education into all treatment sessions in an effort to help people gain a thorough understanding of their injuries and avoid recurrence of symptoms in the future. In her free time Kate enjoys skiing, playing tennis and traveling. She also enjoys spending time with family and friends and going to the beach.